Have Your Pi a la mode! Is the 1200 baud TNC-Pi not enough speed for you? Take a look at the new 9600 baud TNC-Pi9K6! Available now for immediate shipment! The Official Raspberry Pi Touch Display has now been released. 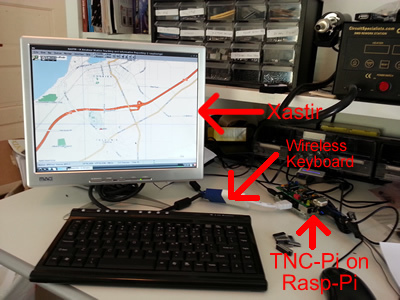 For information on using it to build your own portable APRS Tracker using Xastir check here! There is now a new version of the TNC-Pi designed to fit the Raspberry Pi model B+, Pi 2 and Pi 3 perfectly! See below for details! The original TNC-Pi sits atop Raspberry Pi version B. The 9 pin D-sub connector interfaces to your radio. 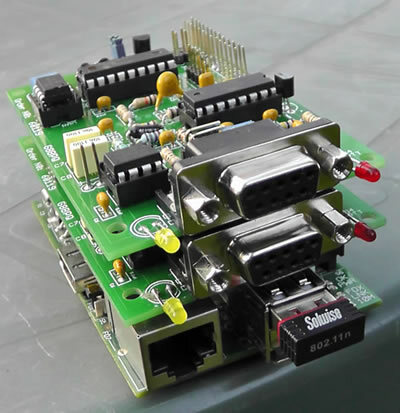 TNC-Pi is a special version of TNC-X designed to interface directly with the Raspberry Pi computer. It can connect to the Pi either via the Pi's serial port, or via the I2C protocol. In the latter case, a single Pi can support multiple TNC-Pi's at the same time, since each TNC-Pi can be given a unique I2C address. 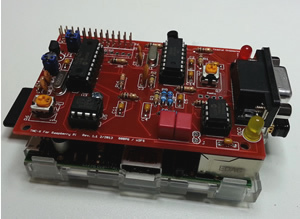 The firmware for TNC-Pi was based on the original TNC-X open source code by John Hansen, W2FS as modified by John Wiseman, G8BPQ to support the I2C protocol as well as the original serial port connection. Here is the Pi 2 sitting atop a Raspberry Pi version B+. It also fits the Pi 2 and Pi 3 perfectly. The TNC-Pi 2 is Now Here! The TNC-Pi 2 is designed to perfectly match the form factor of the Raspberry Pi B+, Pi2 and all Pi 3 models. All 40 header pins are communicated to the top of the TNC-Pi 2 board. The standoff has been repositioned to the bottom left corner to add greater stability. There are lots of potential applications for TNC-Pi. 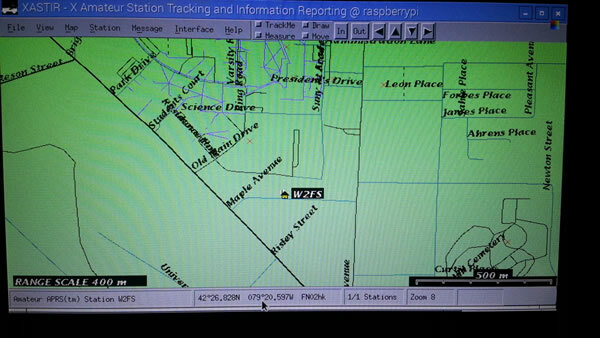 Here you see the APRS program Xastir running on the Pi driving a TNC-Pi via the serial connection. With this setup you've got most of the functionality of a D700/Avmap combination at less than a quarter the cost. Want to send and receive e-mail on your Raspberry Pi using the Winlink system rather than the Internet? Check out Mark Griffith's PiGate at www.pigate.net! Here's Xastir running on a Raspberry Pi with a TNC-Pi and a 7" Raspberry Pi Touch Display ($60). 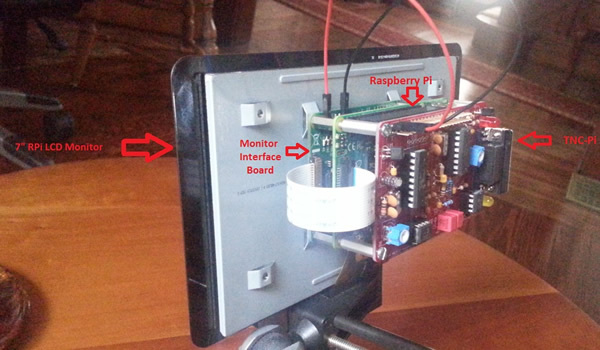 The Raspberry Pi is mounted on the back of the monitor and the TNC-Pi is mounted on the Pi. This makes a very portable APRS station with the only wire connections being a micro USB power cable and a cable to the radio. For more information check here. 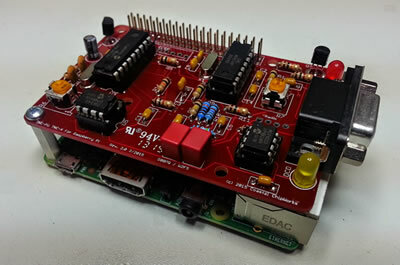 Imagine running a pair of TNC-Pi's with a single Raspberry Pi to create a dual frequency digipeater. G8BPQ has created a new version of his venerable BPQ multi-port packet program that will support this. TNC-Pi is a fun, easy to build kit. All parts are through-hole; there's absolutely no surface mount soldering involved. You can view a copy of the manual here. It is shipping now and is $10 cheaper than the original TNC-X! If you have any questions contact John Hansen W2FS at: john@coastalchip.com. Do you need a cable to connect your TNC-Pi to a Baofeng HT? We have them here.